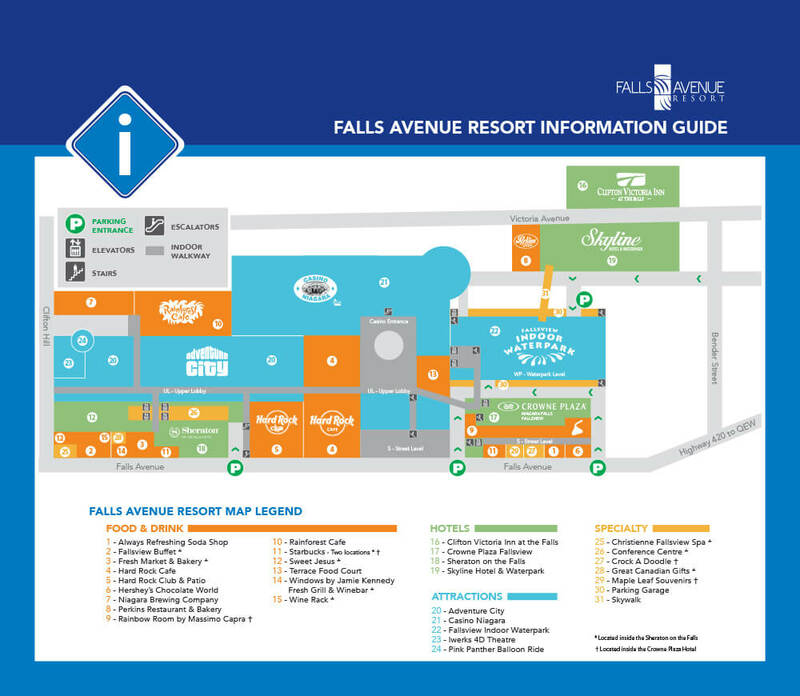 The Sheraton on the Falls is attached to the attractions located at the Falls Avenue Resort. Situated in the heart of Niagara Falls, Falls Avenue Resort is your premier destination for short escapes and extended vacations. Directly overlooking the spectacular Niagara Falls, the Resort features 1,200 rooms, three interconnected hotels, a 3-acre indoor waterpark, twelve restaurants, direct indoor connections to the 24-hour excitement of Casino Niagara, and street level access to the world famous Clifton Hill. The Fallsview Indoor Waterpark is the only waterpark in the world to feature a view of the majestic Niagara Falls, making it one of Niagara’s most popular attractions. The park is home to 16 waterslides, a giant wave pool, the mammoth Beach House Rain Fortress that features a 1000-gallon tipping bucket, an outdoor activity pool and sundeck, and adult-only hot tubs. There is also a Tiny Tots play area for our smallest guests and the The Beach Club, which is ideal for snacks. The Fallsview Indoor Waterpark is a two-time recipient of the TripAdvisor Traveler’s Choice Award for top amusement park & waterpark in Canada. The Waterpark features direct indoor connections to Sheraton on the Falls, Crowne Plaza Fallsview, and Skyline Hotel & Waterpark. Try your luck at Casino Niagara with 95,000 square feet of gaming fun and excitement. Two action-packed floors feature more than 1,500 slot machines and 40 exciting gaming tables. Casino Niagara is also home to the largest poker table in Ontario. There is never a dull moment at Casino Niagara with free live music every weekend and exciting special events throughout the week. Sports enthusiasts will love the Sports Section, which features 26 HD screens and plush lounge seating. Casino Niagara is connected via indoor walkway to the Sheraton on the Falls, Crowne Plaza Fallsview, and is just steps from the Skyline Hotel & Waterpark and Clifton Victoria Inn at the Falls. water jets, and air blasters for a truly interactive experience. Inspired by classic 1950’s diners, the Always Refreshing Soda Shop is a creative blend of soda shop and Coca Cola collector boutique. The shop features favourites from the past, including floats, milkshakes, ice cream, and soda with your choice of flavour shot. The Soda Shop also carries a wide selection of licensed Coca Cola merchandise and souvenirs ideal for all visitors and avid collectors.